Shalom from Modiin, where the weather is set to peak tomorrow at 27 degrees Celsius (80.6 degrees Fahrenheit)–not bad for February! It’s truly amazing what a massive impact the weather can have on our day-to-day life. Having lived the first 50 years of my life in the United Kingdom, I’m certainly no stranger to endless drizzle, windy days, and snow, with the wind-chill factor making it feel like Narnia at its very worst. (I admit, as a child, my greatest thrill would have been to have stepped through the back of my wardrobe and found myself in C.S. Lewis’ magical kingdom!) Narnia notwithstanding, how lucky I feel to live in Israel with its shorter and gentler winters and longer, sunnier summers! Just last week we celebrated Tu B’shvat, the Jewish New Year for trees. This festival normally takes place in winter, and yet, for however long it may last before the weather changes again, today is most definitely a spring-like day. Unlike in Narnia, where trees are permanently shrouded in snow, those on the grounds of the Hadassah Medical Center are showing hopeful signs that the season of spring is just around the corner–early blossom is just appearing on some of them, and green leaves are unfurling. February is that odd month which, even as a child, fascinated me, with its 28 days (and 29 on a leap year), and sitting as a bridge between the cold winter months and the hints of spring. 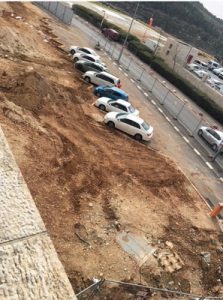 In the same way as many people will also use the season as an opportunity to “spring clean”–to sweep out the dust, check what needs replacing, and do some general updating, Hadassah Hospital is doing the same. Last week I spent a morning at Hadassah Har haTzofim (Mount Scopus, aka, “Little Brother”) and saw so many changes since my last visits there in the late summer. Many of the offices have been closed, and boarded windows tell us that refurbishment is at hand, with a six-month plan due for completion in November. The year of completion wasn’t mentioned, so they are either over-running from November 2017, or they are way ahead of schedule for completion in November 2018! Either way, it is a positive sign that, as Hadassah’s services continue to develop to meet the needs of its patients, the administration also sees that the finest hospitals need to recruit and retain world-class staff, and in order to do so, their facilities can be as important as those for the patients. Work is also underway at Hadassah Hospital Ein Kerem (aka “Big Brother”), where I was admitted for a week in December 2017 to investigate my poor balance and “wobbles.” A whole new pediatric optic department is due to open soon, and the main optic department has recently been expanded, with the patient check-in moving to a new area. Patients now collect a numbered ticket and wait to be called to check in. Those with Israeli chutzpah (audacity) will still wave a ticket number 89 and insist it’s 68 and that they are next to be seen! I have been incredibly fortunate that my wonderful husband, Louis–who truly is my unsung hero– has been on hand to take me to and from every appointment at Hadassah, as getting there by public transport is no mean feat! This is now set to change, however, with the Jerusalem Light Rail being extended to the hospital! Construction has just started, with diggers aplenty on the site. The rotunda lobby now proudly houses a large screen which, in time, will display the train’s timetable; for now, it provides information on the project. 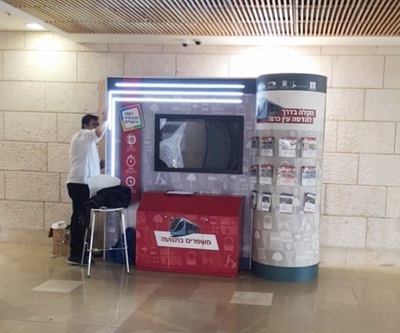 Leaflets are available in Hebrew, Arabic, Russian, and English, reflecting the population of Israel. They speak of a three-year construction project. Even as a relatively new Olah (immigrant), I wouldn’t expect to see it running before at least five years are up! Thanks to the outstanding treatment that I have been privileged to have experienced in so many departments, I am hoping that 2018 will be an in-patient free year for me. I hope that, as part of its “New Year’s resolutions,” Hadassah takes the opportunity to review the outpatients appointment systems. In some departments, it seems that all the morning appointments are called for the same time, and the consultants and doctors then work their way steadily through their list. This can lead to waiting rooms fit to burst at the seams and disgruntled patients, but frustration is certainly eased by the patience of the dedicated staff, keeping us informed, and volunteers sweetening our wait with trolleys loaded with treats. 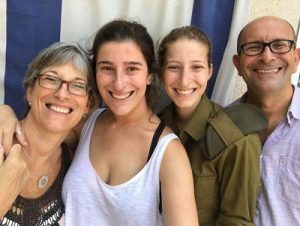 In my second Hadassah blog, I named Miri, who volunteers three days a week to offer patients treats from her trolley, as my Unsung Hero. 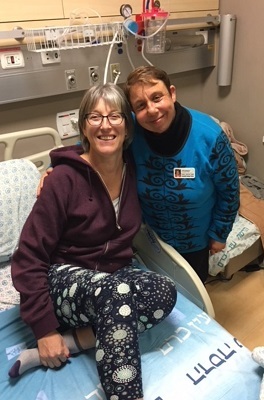 I would like today to name another volunteer as my latest Unsung Hero: Annabelle (pictured above)–a veteran Olah from the United States, who visited me in my bed on the neurology ward one evening, sat and drank tea with me, and just chatted. Sometimes this type of chat can be as powerful as medicine; a chance to vent feelings, to express concerns, to laugh or to cry without burdening your family. Thank you, Annabelle for being there just at the right time for me. And so my treatment continues. I know that without the care and attention of the staff at Hadassah, my life could be very different right now, and I guess my resolution for 2018 is to see less of them!